Norma 203B has been nearly impossible to obtain in the USA in recent years. Expressly formulated for the 6mmBR cartridge, many consider the elusive Norma 203B powder to be the “Holy Grail” of propellants for this popular chambering. It also works well in cartridges for which Varget, VV N150, or Reloder 15 is suitable. Now, with Black Hills Shooters Supply (BHSS) as a distributor, Norma is finally making 203B available again for American reloaders. Consumers can’t buy direct from BHSS, but retail vendors can place wholesale orders with BHSS, which has 472 pounds of Norma 203B as of 4/7/2008. Powder Valley has Norma 203B in stock right now at $19.00 per pound, and Grafs.com has it for $21.99 per pound (item NP203B1). We’ve tried 1998 vintage Norma 203B in a 6BR and it was very similar to Reloder 15 in appearance, but the Alliant powder yielded slightly higher velocities. What we noticed shooting a 6BR with Norma 203B was a HUGE accuracy window. With 105gr bullets, the powder shot very well at a wide variety of charge weights, from mild to max. Plus, ES and SD were extremely low. Average 5-shot Extreme Spread was 8 fps, with three 5-shot groups measured. Norma 203B did display greater temp sensitivity than Varget, however. If you want to try Norma 203B for yourselves, don’t hesitate — call Powder Valley, (800) 227-4299, or other stocking retailer before the current supply is exhausted. It could be many months before the next shipment arrives. Share the post "Norma 203B Powder Now Available"
Remington Closes H&R Plant — 200 Jobs Lost. The Harrington & Richardson plant in Gardner, MA is the latest victim in the series of consolidations in the firearms industry. 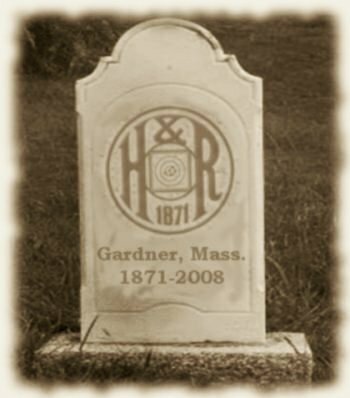 Remington announced on April 7, 2008 that it would close the H&R 1871 facility in Gardner, and all plant operations would be shut down by the end of the year. Remington Arms, part of the Cerberus family of companies, acquired Marlin Firearms earlier this year. The Marlin deal also included H&R 1871 Inc., which was purchased by Marlin in 2000. H&R operated as New England Firearms. With its line of Harrington & Richardson rifles, and L.C. Smith shotguns, H&R 1871 was the leading seller of single-shot rifles and shotguns in the world. Gardner, Massachusetts Mayor Mark Hawke criticized the plant closure, saying that local officials were blind-sided by the move. He stated that Remington never contacted state or local officials prior to announcing its decision to close the Gardner factory. Share the post "Remington Closes H&R Plant — 200 Jobs Lost."